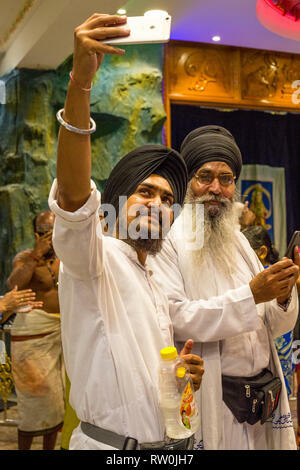 Batu Caves, Sikh Visitors Taking a Selfie, Selangor, Malaysia. 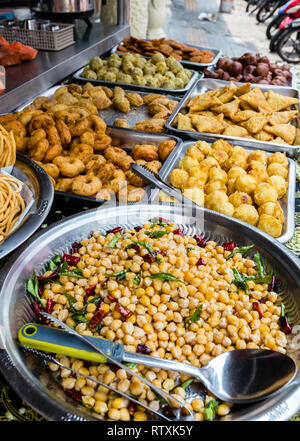 Little India Streetside Restaurant Serving Indian fast Food, Brickfields, Kuala Lumpur, Malaysia. 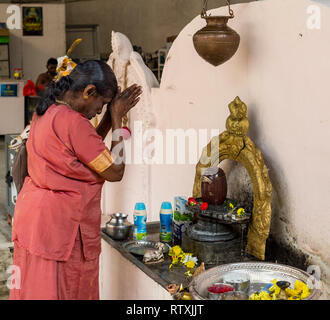 A Worshiper Pours Water over the Shiva Lingam upon entering the Hindu Sri Maha Muneswarar Temple, Kuala Lumpur, Malaysia. 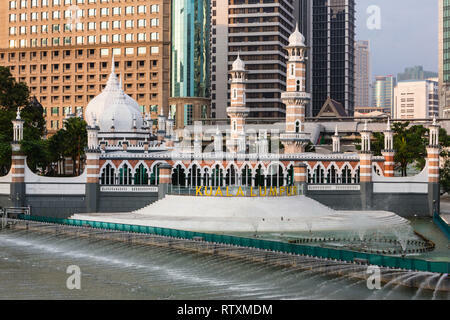 Masjid Jamek (Jamek Mosque), Kuala Lumpur, Malaysia. 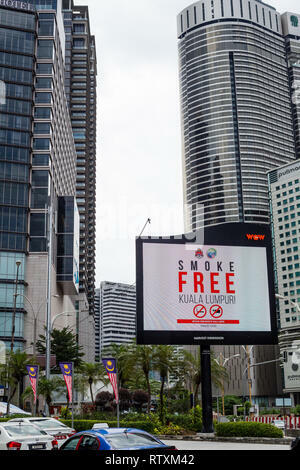 Anti-smoking Billboard, Promoting a Smoke-free Kuala Lumpur, Malaysia. 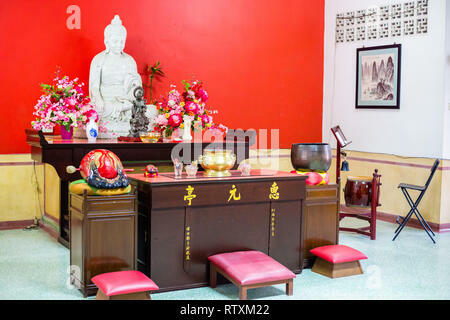 Wul Ngon Tin Chinese Buddhist Temple Altar, Kuala Lumpur, Malaysia. 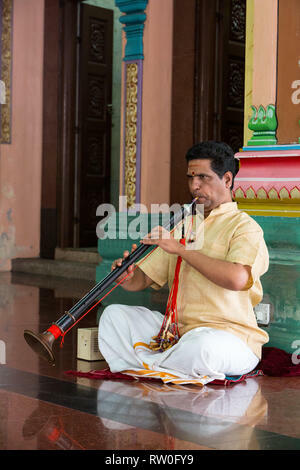 Musician Playing a Nadaswaram, an Indian Wind Instrument, Sri Mahamariamman Hindu Temple, Kuala Lumpur, Malaysia. 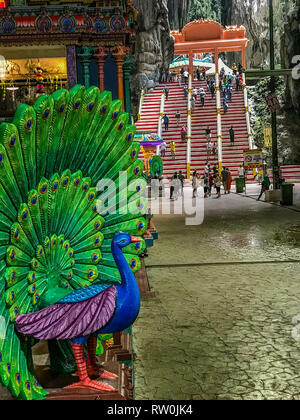 Batu Caves, Peacock, Mount of Hindu God of war Murugan, Selangor, Malaysia. 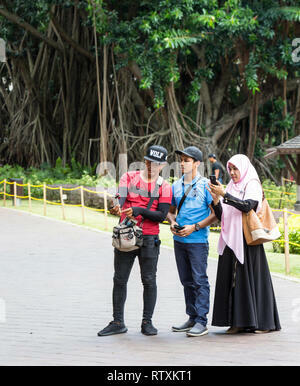 Young Malaysians Taking a Photo, KLCC Park, Kuala Lumpur, Malaysia. 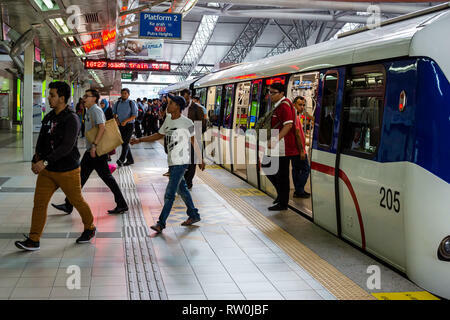 Passengers Leaving MRT (Mass Rapid Transit) Train at KL Sentral Station, Kuala Lumpur, Malaysia. 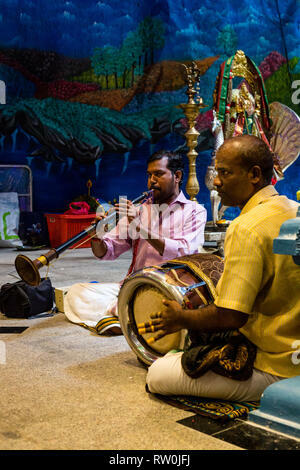 Batu Caves, Musicians Playing a Thavil (South Indian Drum) and Nadaswaram (Indian wind instrument), Selangor, Malaysia. 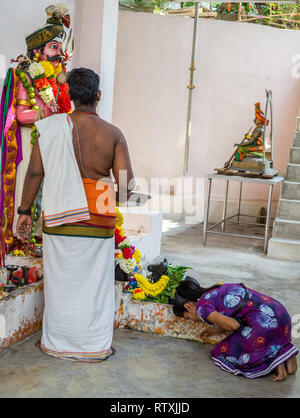 Worshiper Praying at Hanuman Shrine, Sree Veera Hanuman Hindu Temple, Kuala Lumpur, Malaysia. 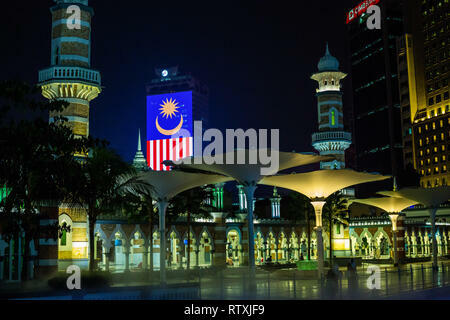 Masjid Jamek (Jamek Mosque) at night, Kuala Lumpur, Malaysia. Malaysian Flag in background. 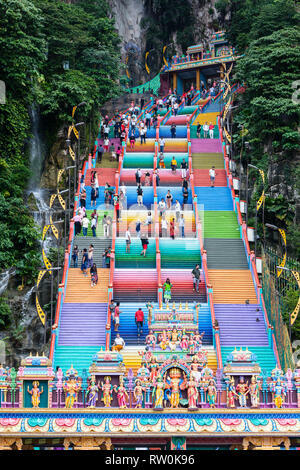 Stairs Leading to Batu Caves, Hindu Deities in foreground, Selangor, Malaysia. 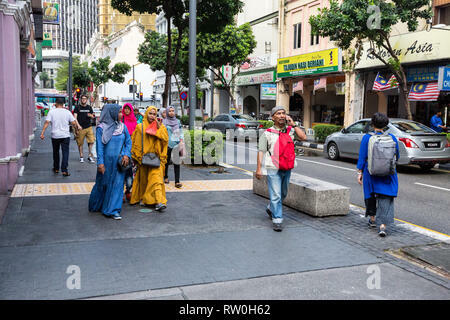 Jalan Hang Kasturi Street Scene, Kuala Lumpur, Malaysia. 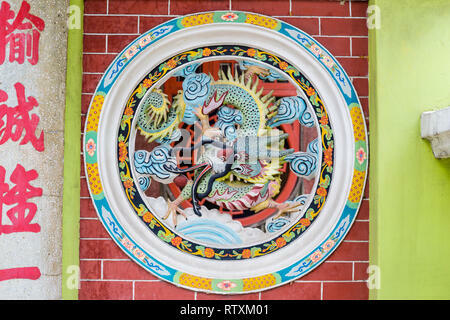 Sin Sze Si Ya Taoist Temple, Chinatown, Kuala Lumpur, Malaysia. 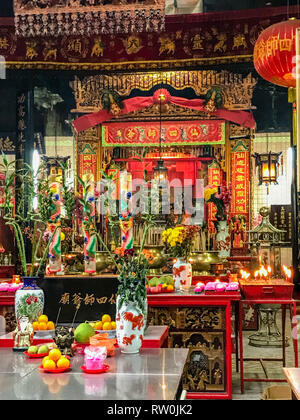 Joss Stick Urns and Altar Decorations. Oldest Taoist temple in Kuala Lumpur (1864). Central Market, Chocolates, Cookies, and Stuffed Animals for Sale, Kuala Lumpur, Malaysia. 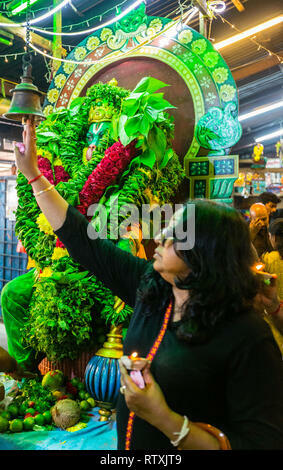 Woman Praying to Hindu Deities, Hindu Sri Maha Muneswarar Temple, Kuala Lumpur, Malaysia. 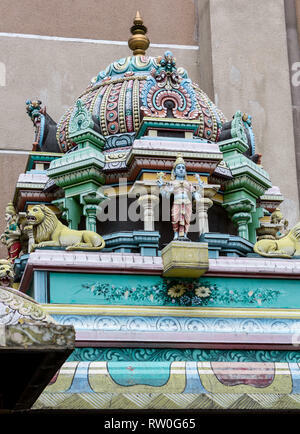 Sri Mahamariamman Hindu Temple Decoration, Kuala Lumpur, Malaysia. 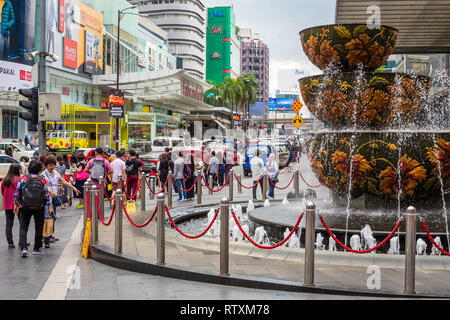 Fountain outside Pavilion Mall, Jalan Bukit Bintang on a Sunday Afternoon, Kuala Lumpur, Malaysia. 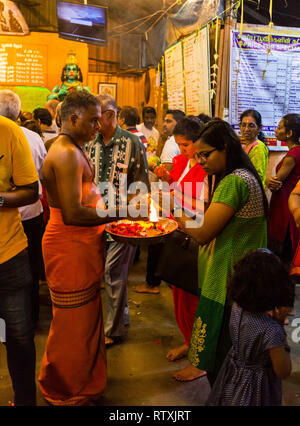 Hindu Priest with Worshiper Performing Ritual of Touching the Lamp, Sree Veera Hanuman Hindu Temple, Kuala Lumpur, Malaysia. 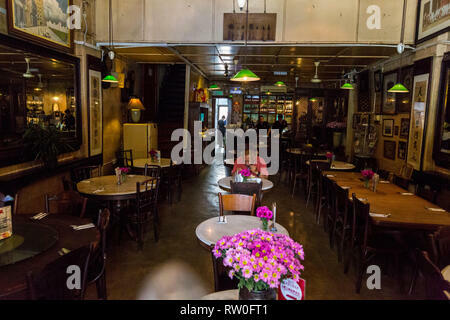 Chinese Tea Cafe, Chinatown, Kuala Lumpur, Malaysia. 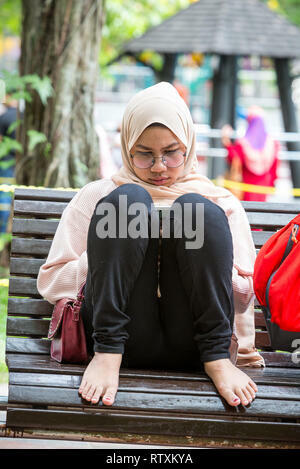 Young Malaysian Woman Reading on a Park Bench, KLCC Park, Kuala Lumpur, Malaysia. 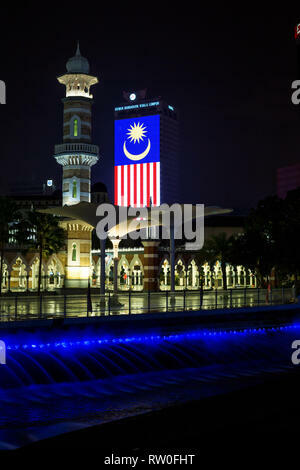 Masjid Jamek (Jamek Mosque) at night, Malaysian Flag in background. 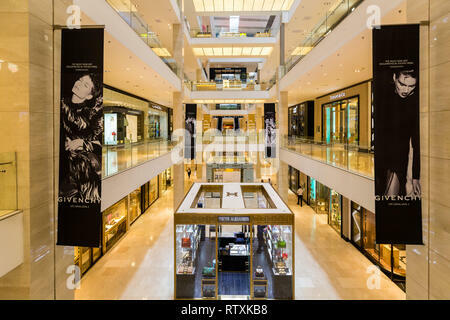 Kuala Lumpur, Malaysia. 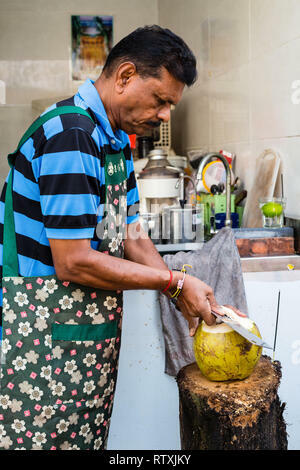 Man Eating Coconut Pulp after Drinking Coconut Water, Kuala Lumpur, Malaysia. 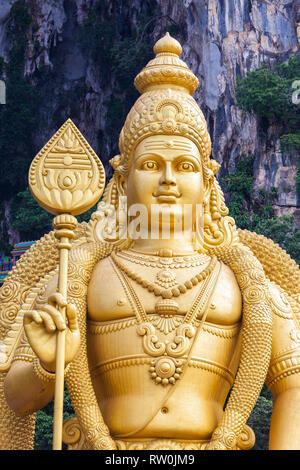 Batu Caves, Hindu God Murugan, God of War, Selangor, Malaysia. 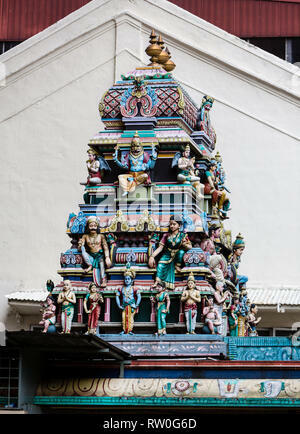 Hindu Deities on Interior Courtyard Decoration, Sri Mahamariamman Hindu Temple, Kuala Lumpur, Malaysia. 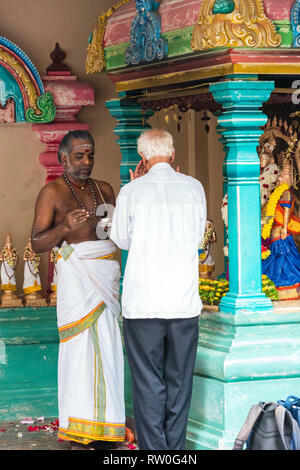 Worshiper Receiving a Blessing from a Hindu Priest, Sri Mahamariamman Hindu Temple, Kuala Lumpur, Malaysia. 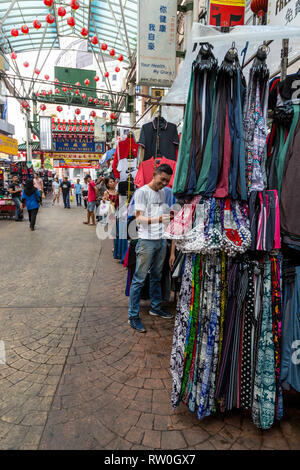 Jalan Petaling Street Market, Chinatown, Kuala Lumpur, Malaysia. 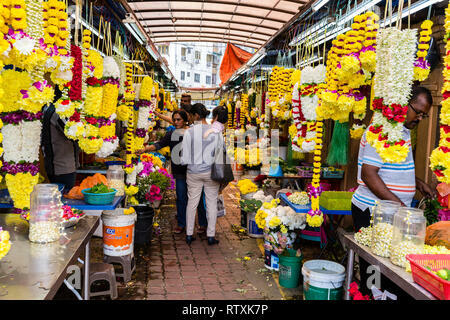 Flower Vendor Lane, Little India, Brickfields, Kuala Lumpur, Malaysia. 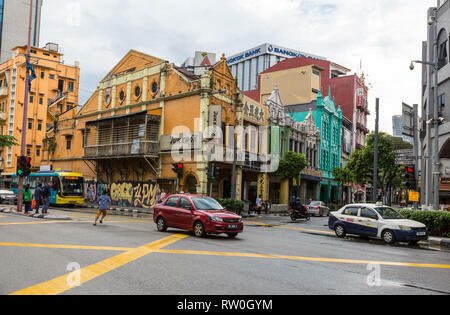 Shophouses, Early Twentieth century, Kuala Lumpur, Malaysia. 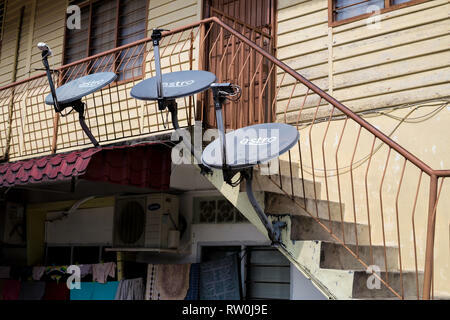 Kampung Baru, TV Satellite Dishes on Typical Middle-class House in Traditional Malay Enclave, Kuala Lumpur, Malaysia. Hindu Priest and Worshipers, Sri Mahamariamman Hindu Temple, Kuala Lumpur, Malaysia. 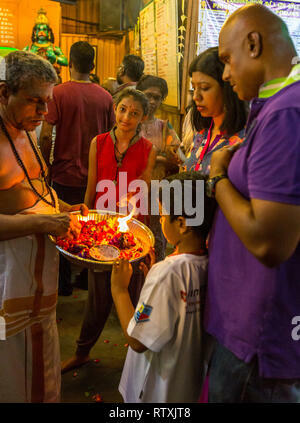 Hindu Priest with Family Performing Ritual of Touching the Lamp, Sree Veera Hanuman Hindu Temple, Kuala Lumpur, Malaysia. 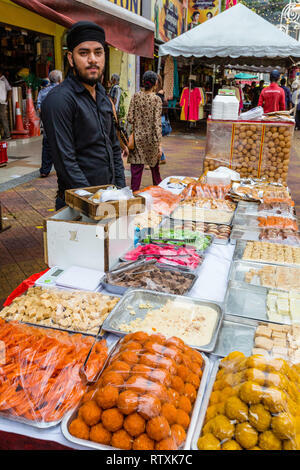 Sidewalk Vendor of Candy, Pastries, and Sweets, Brickfields, Little India, Kuala Lumpur, Malaysia. 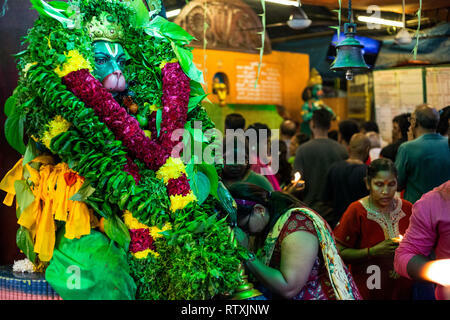 Hindu God Hanuman Decorated with Garlands and Offerings, Sree Veera Hanuman Temple, Kuala Lumpur, Malaysia. 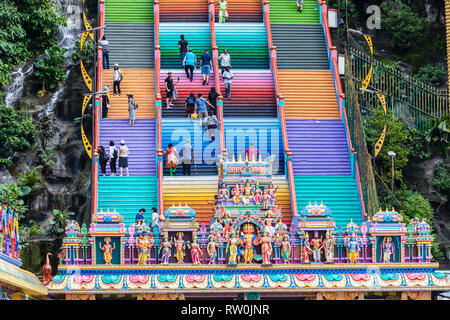 Batu Caves, 272 Multicolored Stairs Leading to the Top, Hindu Deities in foreground. Selangor, Malaysia. 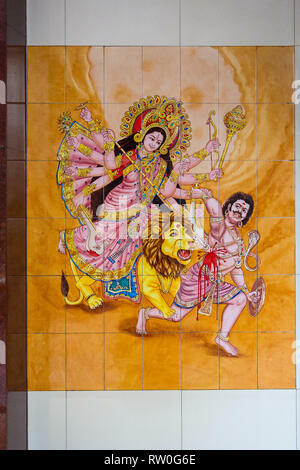 Durga Warrior Goddess in Wall Tile Decoration, Sri Mahamariamman Hindu Temple, Kuala Lumpur, Malaysia. 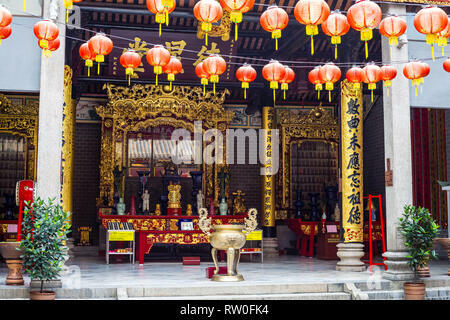 Wul Ngon Tin Chinese Buddhist Temple, Decoration by Entrance, Kuala Lumpur, Malaysia. 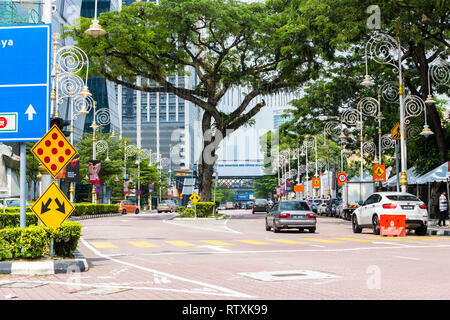 Street Scene, Jalan Tun Sambanthan, Little India, Brickfields, Kuala Lumpur, Malaysia. Young Malaysian Women in Typical Dress, Kuala Lumpur, Malaysia. 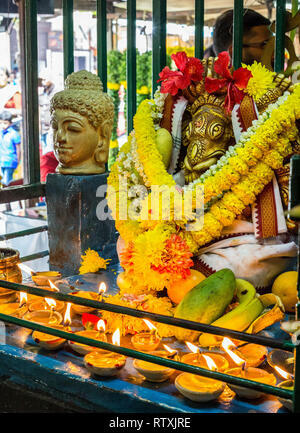 Candles, Garlands, and Offerings at Shrine in Sree Veera Hanuman Hindu Temple, Kuala Lumpur, Malaysia. 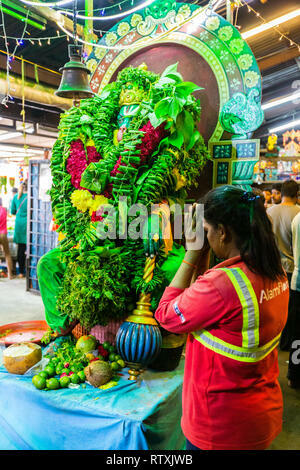 Worshipers Offering Prayers to Hindu God Hanuman, Decorated with Garlands and Offerings, Sree Veera Hanuman Temple, Kuala Lumpur, Malaysia. 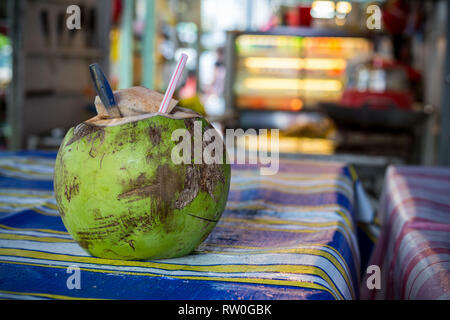 Coconut, Open for a Customer, Kuala Lumpur, Malaysia. 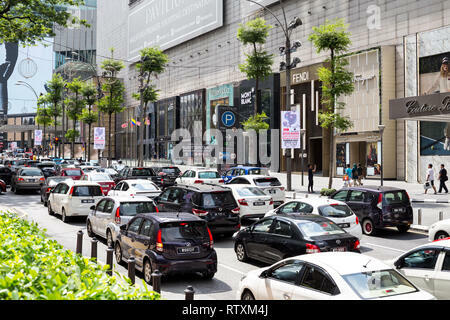 Sunday Afternoon Traffic on Jalan Bukit Bintang, Pavilion Mall on right. 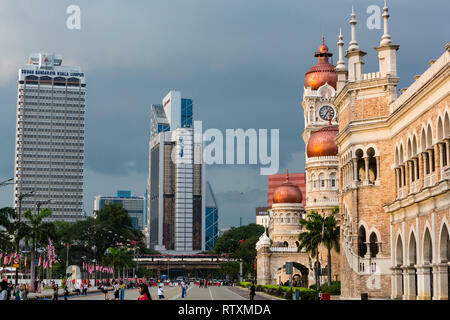 Kuala Lumpur, Malaysia. 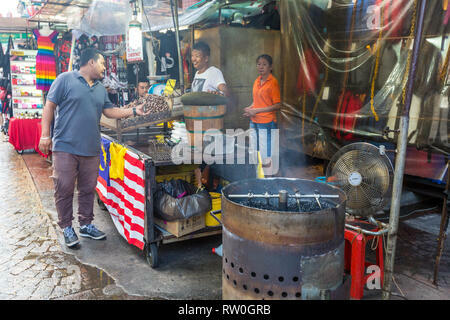 Jalan Petaling Street Market, Roasting Coffee Beans, Chinatown, Kuala Lumpur, Malaysia. 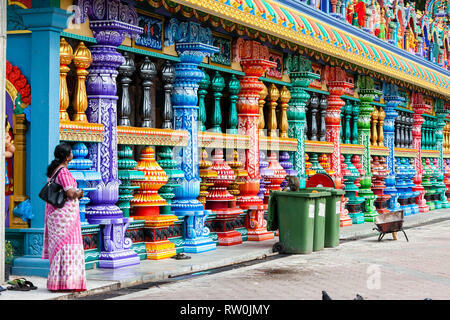 Batu Caves, Columns of Hindu Temple at Base of Stairs Leading to Caves, Selangor, Malaysia. 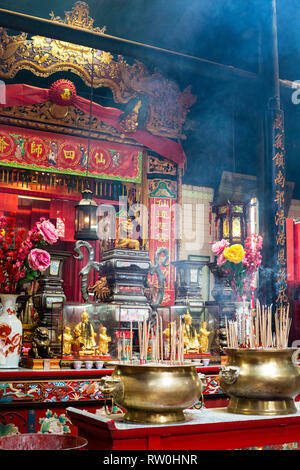 Buddhist Shrine and Incense, Maha Vihara Buddhist Temple, Kuala Lumpur, Malaysia. 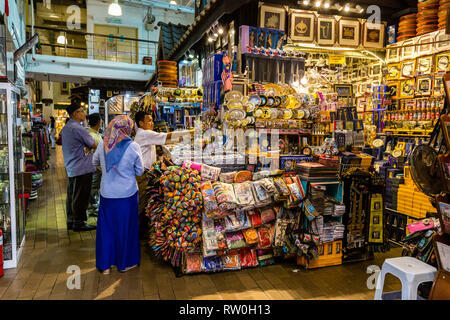 Central Market, Souvenir Handicrafts Shop, Kuala Lumpur, Malaysia. 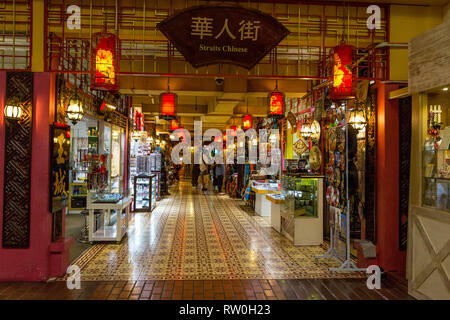 Central Market, Handicrafts and Souvenir Shops, Kuala Lumpur, Malaysia. 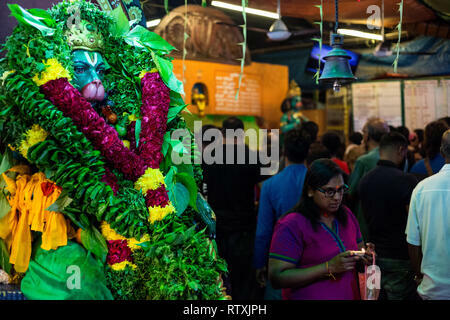 Batu Caves, Worshipers Awaiting Blessing by Priest, Selangor, Malaysia. 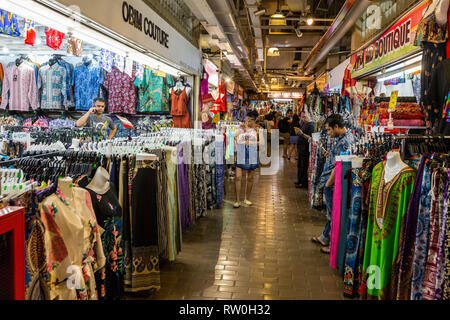 Central Market, Clothing for Sale, Kuala Lumpur, Malaysia. 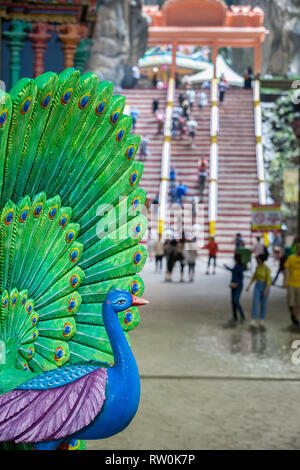 Batu Caves, Peacock, Mount of Lord Murugan, Hindu God of War, Selangor, Malaysia. 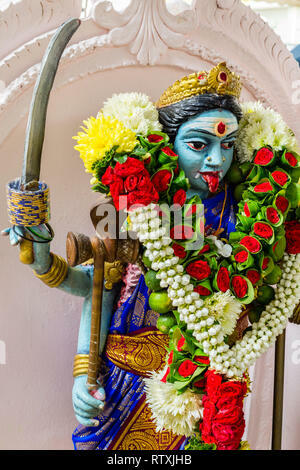 Goddess Kali in the Hindu Sri Maha Muneswarar Temple, Kuala Lumpur, Malaysia. 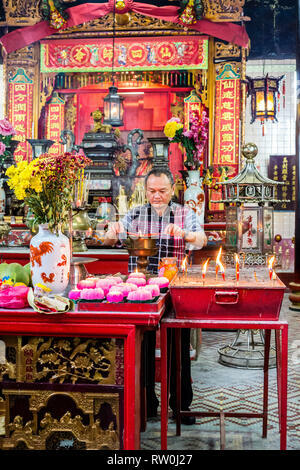 Sin Sze Si Ya Taoist Temple, Chinatown, Kuala Lumpur, Malaysia. 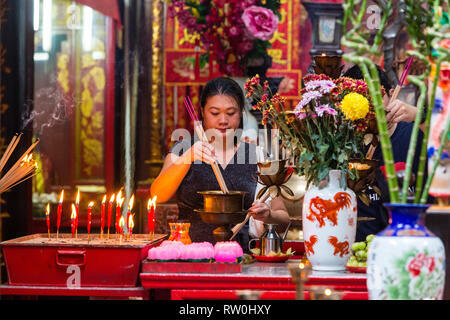 Woman Lighting Joss Sticks. Oldest Taoist temple in Kuala Lumpur (1864). 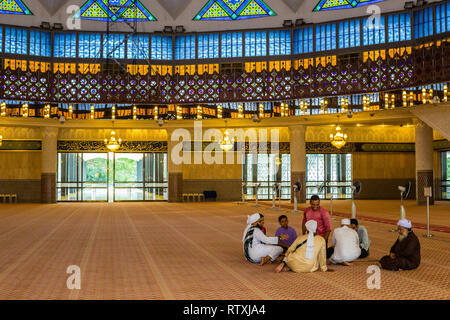 Men Talking in the Prayer Hall of the Masjid Negara (National Mosque), Kuala Lumpur, Malaysia. Sin Sze Si Ya Taoist Temple Offerings, Chinatown, Kuala Lumpur, Malaysia. Oldest Taoist temple in Kuala Lumpur (1864). 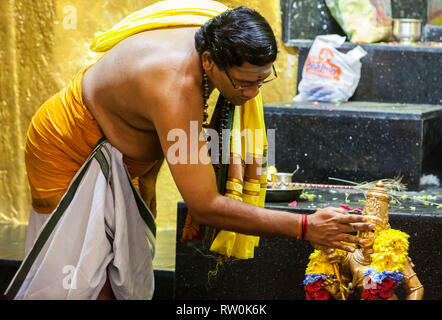 Batu Caves, Hindu Priest Performing Ceremony at Shrine to Lord Murugan, Hindu God of War, Selangor, Malaysia. 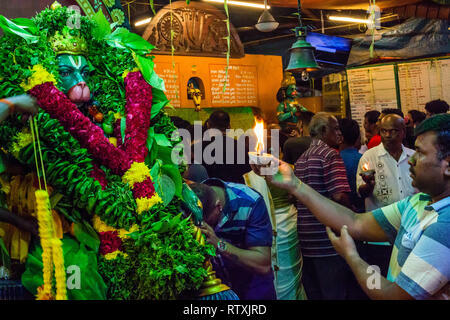 Worshiper Ringing Bell while Circumambulating Hanuman Shrine, Sree Veera Hanuman Hindu Temple, Kuala Lumpur, Malaysia. 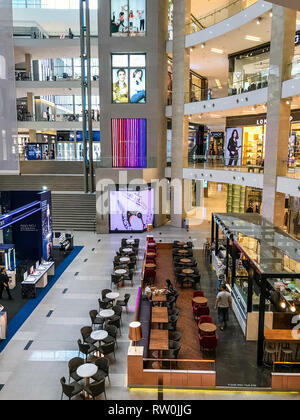 Pavilion Mall Interior View, Bukit Bintang, Kuala Lumpur, Malaysia. Bangladeshi Muslim Visiting the Masjid Negara (National Mosque) in Kuala Lumpur, Malaysia, Writing Email Address for Photographer. 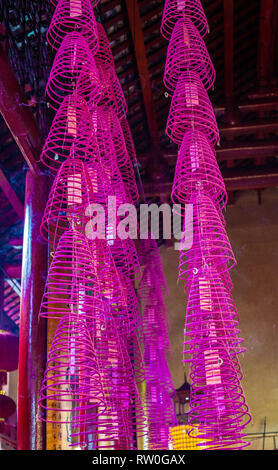 Incense Coils, Guan Di (Kuan Ti) Taoist Temple, Chinatown, Kuala Lumpur, Malaysia. 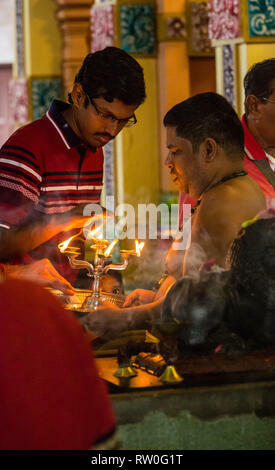 Hindu Priest and Young Worshiper at Hindu Sri Maha Muneswarar Temple, Kuala Lumpur, Malaysia. 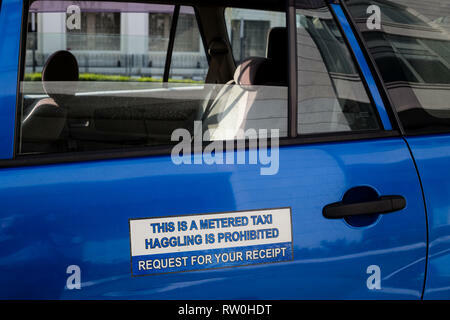 Taxi Sign, Haggling Prohibited. 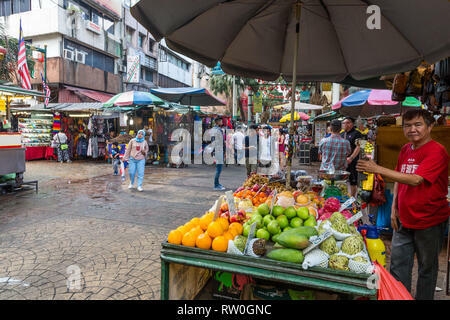 Jalan Petaling Street Market, Chinatown, Kuala Lumpur, Malaysia. 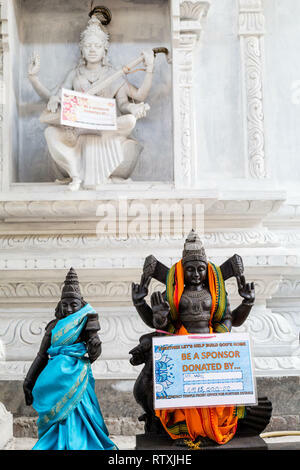 Signs on Hindu Deities Soliciting Funds for Temple Refurbushment, Hindu Sri Maha Muneswarar Temple, Kuala Lumpur, Malaysia. 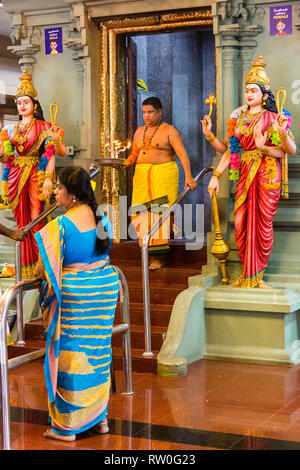 Hindu Priest Emerging from Inner Shrine, Sri Mahamariamman Hindu Temple, Kuala Lumpur, Malaysia. 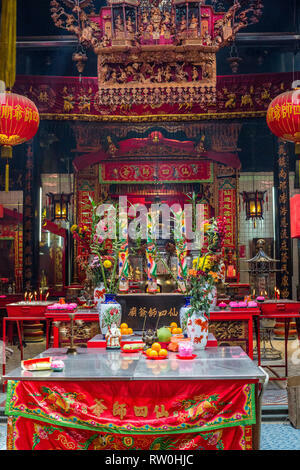 Red Lanterns and Altar in Chan See Shue Yuen Chinese Clan House, Kuala Lumpur, Malaysia. 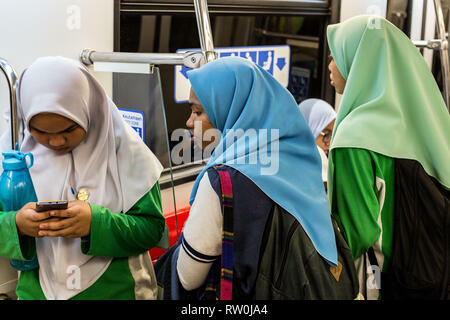 Passengers on the MRT (Mass Rapid Transit), Kuala Lumpur, Malaysia. 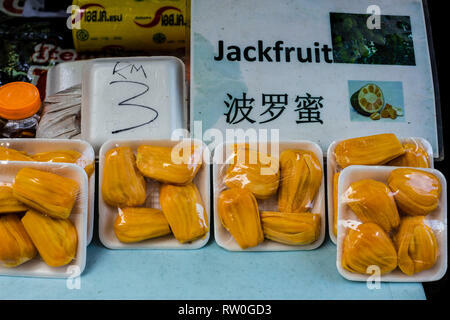 Packaged Pieces of Jackfruit, Kuala Lumpur, Malaysia. 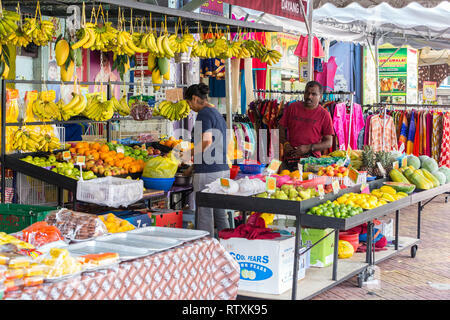 Sidewalk Fruit Vendor, Little India, Brickfields, Kuala Lumpur, Malaysia. Petronas Towers from KLCC Park, Kuala Lumpur, Malaysia. 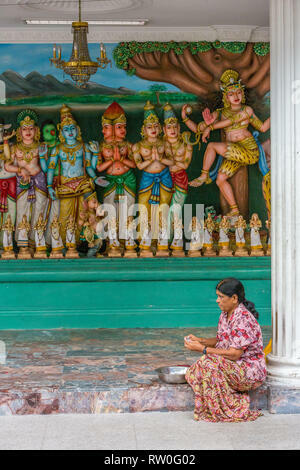 Woman Praying in front of Shiva Lingam before Entering Hindu Sri Maha Muneswarar Temple, Kuala Lumpur, Malaysia. 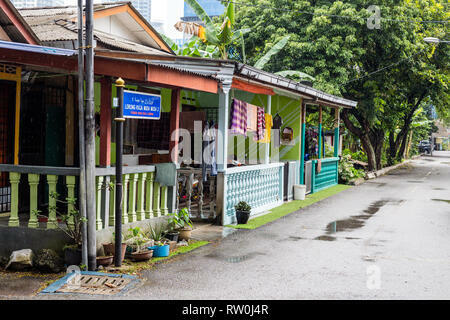 Kampung Baru, Typical Private Family House in Traditional Malay Enclave, Kuala Lumpur, Malaysia. 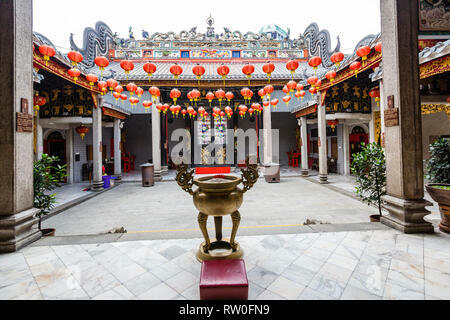 Inner Courtyard, Chan See Shue Yuen Chinese Clan House, Kuala Lumpur, Malaysia. 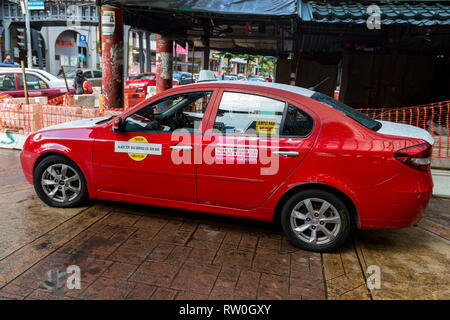 Taxi Sign, Haggling Prohibited, Kuala Lumpur, Malaysia. 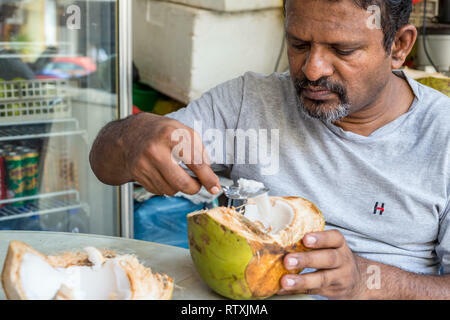 Coconut Vendor Opening a Coconut, Kuala Lumpur, Malaysia. 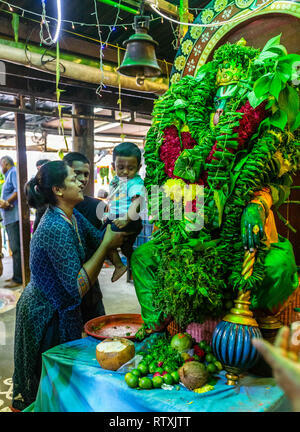 Parents Introducing Son to Hanuman Shrine, Sree Veera Hanuman Hindu Temple, Kuala Lumpur, Malaysia. 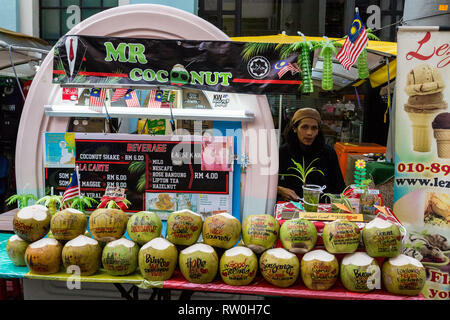 Coconut Water Vendor, Kuala Lumpur, Malaysia. 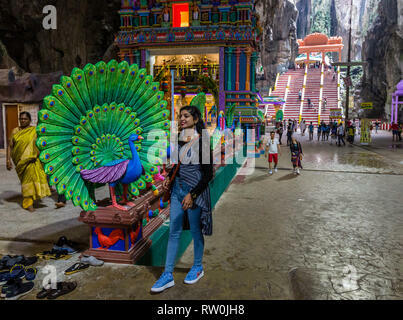 Batu Caves, Woman Posing for Picture next to Peacock, Mount of Lord Murugan, Hindu God of War, Selangor, Malaysia. 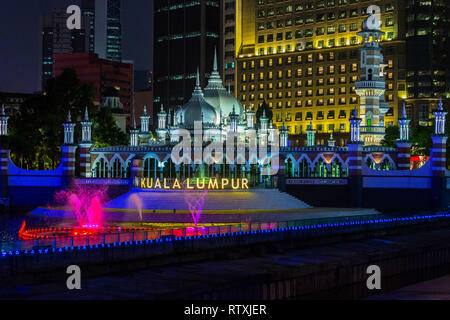 Masjid Jamek (Jamek Mosque) at night, Kuala Lumpur, Malaysia. 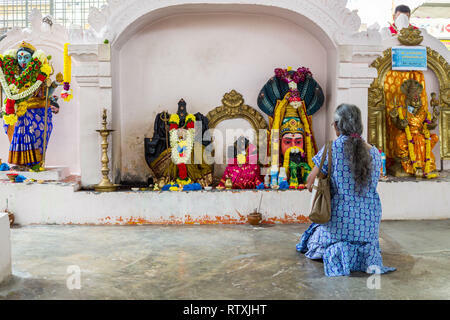 Worshiper Preparing Offerings as Hindu Deities Line the Wall, Sri Mahamariamman Hindu Temple, Kuala Lumpur, Malaysia. 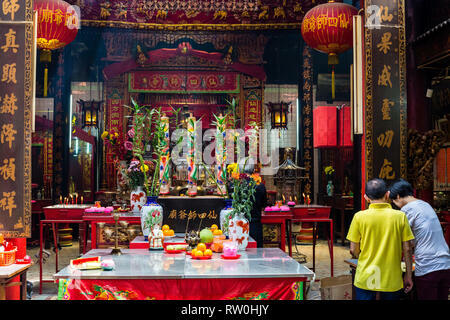 Sin Sze Si Ya Taoist Temple, Chinatown, Kuala Lumpur, Malaysia. 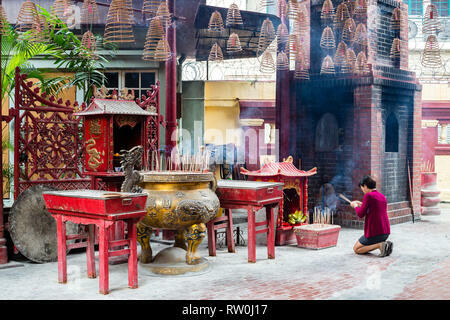 Worshiper Kneeling with Joss (Incense) Sticks in front of Shrine. 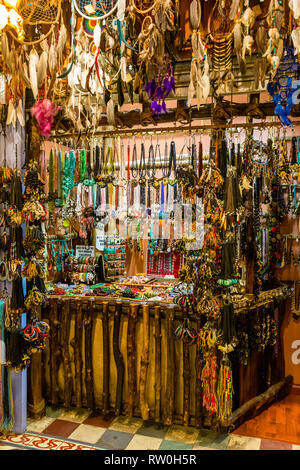 Central Market, Handicraft Jewelry, Kuala Lumpur, Malaysia. 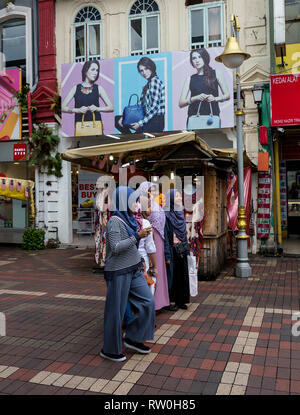 Teenage Malaysian Girls in Typical Modest Muslim Dress Waiting to Board a Bus, Kuala Lumpur, Malaysia. 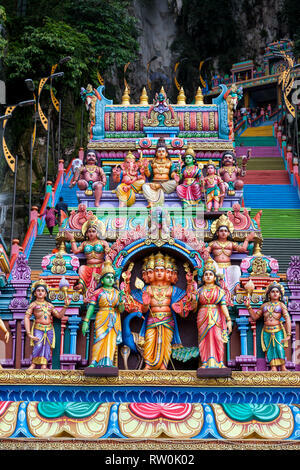 Batu Caves, Hindu Deities above Entrance to Steps leading to Caves, Selangor, Malaysia. 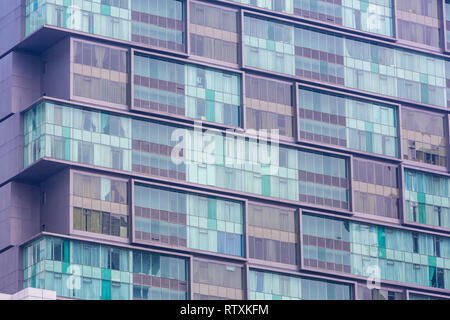 Modern Apartment Building in Central Kuala Lumpur, Malaysia. 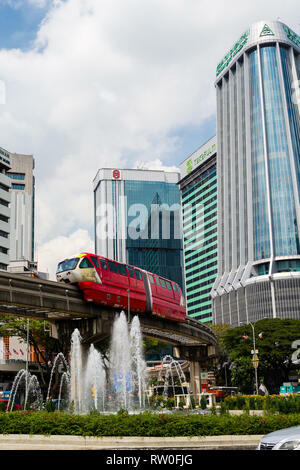 MRT (Mass Rapid Transit) Monorail, Kuala Lumpur, Malaysia. 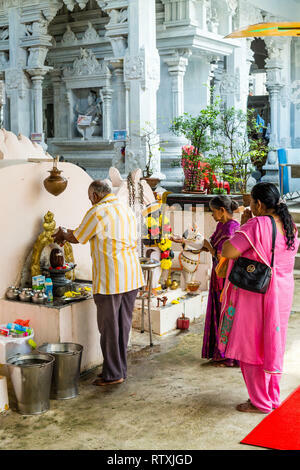 Hindu Priest Receiving Donations in front of Sri Anjaneyar Shrine, Kuil Sri Krishna Hindu Temple, Kuala Lumpur, Malaysia. 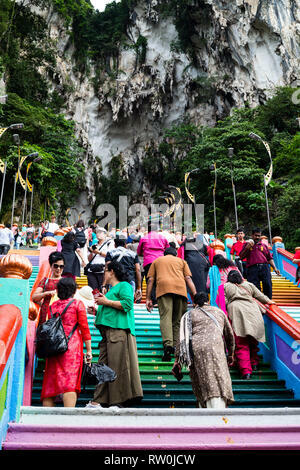 Batu Caves, Visitors Ascending Steps, Selangor, Malaysia. 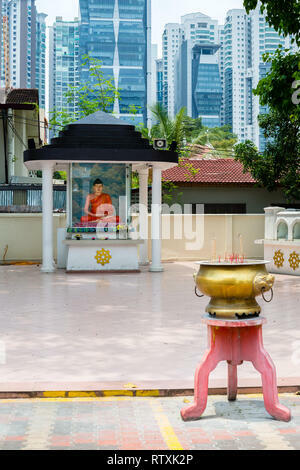 Vietnamese Buddhist Monk Touring Kuala Lumpur, Malaysia. 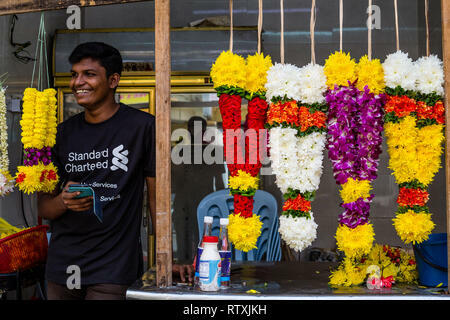 Garlands for Sale outside a Hindu Temple, Kuala Lumpur, Malaysia. 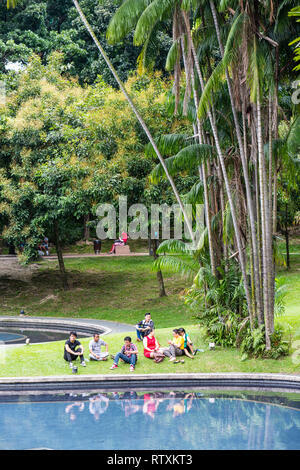 Malaysians Relaxing at KLCC Park, Kuala Lumpur, Malaysia. 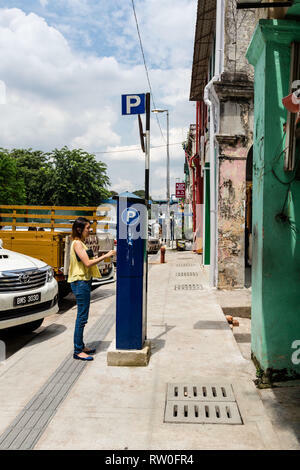 Motorist Paying for Parking, Kuala Lumpur, Malaysia.